During March, 2018, Gwen and Mike will be the featured artists at Artisans on fifth. Their art glass and jewelry will be featured in the front window at Artisans during the entire month. They will also be part of a March Artisan on fifth art exhibit at the W.T. Bland Public Library at 1995 N Donnelly St. in Mt. Dora, FL 32757. I created this bead and wire art bra for the Bra-Vo Exhibit sponsored by Artisans on fifth. It was on display at the Mount Dora Center for the Arts during the month of October, 2017. This exhibit is part of a fundraising event to raise money for low or no cost mammograms for residents of Lake County, FL. The website for Bra-Vo is www.bra-vo.org. 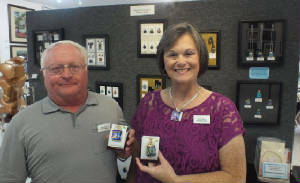 Mount Dora Center for the Arts presented a Jewelry & Accessories Show at Lake Receptions in Mt. Dora on Sept. 30 and Oct. 1, 2017. We were pleased to be juried-in. There were 50 jewelry artists there. ​Gwen had a fused glass wall art piece on display at the Appleton Museum of Art from September 12 - November 1, 2015. The show was titled "Celebrating Artistic Diversity" and her piece is distinctly diverse from the other artworks. It is a 20" X 9" framed fused glass piece featuring colorful dichroic glass circles that have hand-etched Zentangle Mandala images on them. The Museum is located at 4333 E Silver Springs Blvd., Ocala FL 34470 (www.appletonmuseum.org). We were the Artists of the Month during the month of September, 2015 at Artisans on fifth in Mt. Dora, FL. There was a special Artist's Reception hosted by us on September 11, 2015. however our newest pieces are on display all the time at Artisans on fifth. See www.artisansonfifth.com for more information and the address. We were Featured Artists of the Month during the month of December, 2014. There was a special Open House Reception hosted by us on December 12, 2014. 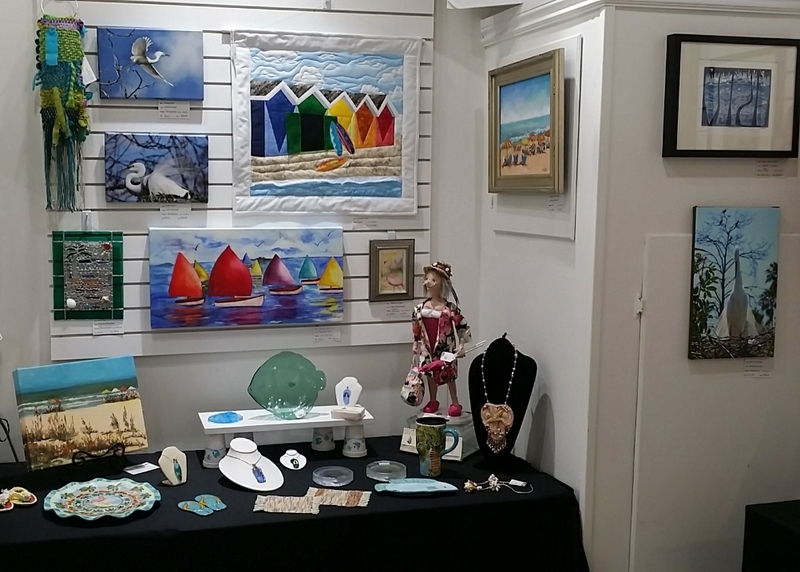 This exhibit, in July 2015, featured art from all the members of Artisans on fifth. Our Florida-flavor art was included. ​In May, 2014 Gwen won "Best in Show" with the same piece of artwork! The award was given in an exhibition titled "It's All in the Details" sponsored by the Ocala Art Group (OAG). The picture, presented in a shadowbox, was titled "Zen Patchwork." The Judge, Victoria Billig, Asst. Director of Museum Operations at the Appleton Museum of Art, said "This piece is incredibly detailed and very well done -- a perfect example of the exhibition's theme. Working in fused glass can often be tedious and I thought both the level of detail and the artistic merit were very high." ​Although wall art is not our main focus, in April 2014, Gwen Hertz won 1st Place in Professional Cold-working at the Glass Craft and Bead Expo in Las Vegas. This is an international competition. She entered a hand engraved wall art piece that has Zentangle patterns engraved on colored dichroic glass. ​We did a trunk show at the Bead Strand selling only our fused glass , not finished jewelry. Some of the pieces were my "Signature Collection". We previously sold our art at this event twice a year along with other members of Gallery East. Several art organizations participate in this fundraising event to help make money for the park. ​During the months of November and December, 2013 we will have jewelry in a special exhibit in the alcove at Artisans on fifth. Artisans on fifth is at 134 5th Ave., Mount Dora FL 32757. Visit www.artisansonfifth.com for more information. During the month of October, 2013 we will have jewelry in a special exhibit in the alcove at Artisans on fifth. October's exhibit is called "Art that Inspires". Artisans on fifth is at 134 5th Ave., Mount Dora FL 32757. Visit www.artisansonfifth.com for more information.